When she winked the whole of the Internet came crashing down making the Malayalam actress Priya Prakash Varrier an instant celebrity. The video clip that she was a part of was later made into a string of memes, social media posts etc. Now, according to reports Varrier is all set to make her maiden steps into Bollywood. 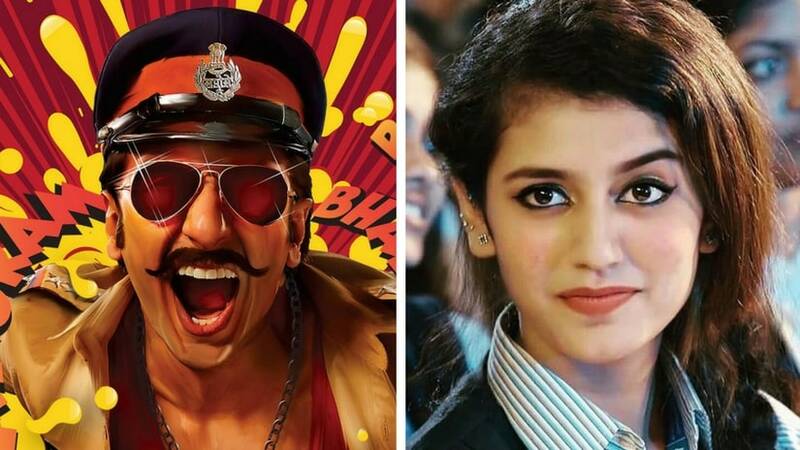 Deccan Chronicle, in one of its reports, claim that the Oru Adaar Love actress is being considered to star opposite Ranveer Singh in the upcoming Rohit Shetty film, Simmba. Simmba is a joint venture between Shetty and Karan Johar's Dharma Productions that would star Ranveer as an uncanny cop. The film is touted to be flavoured with all the elements that make for a quintessential Shetty entertainer. The Deccan Chronicle report further adds that Shetty is known for introducing south Indian actresses into Bollywood. For example, Kajal Aggarwal's casting in Singham; considering Anushka Shetty for Singham 2 etc. Moreover, Karan Johar is the dream launch pad for any new comer in Bollywood. Starting from Rani Mukerji (Kuch Kuch Hota Hai) to Alia Bhatt (Student of the Year) and now Janhvi Kapoor (Dhadak), Johar has been instrumental in making their presence felt in the Bollywood filmdom. No official confirmation regarding Varrier's casting in Simmba has been made either by the director or by the production house.